ATHENS, Oct 10 2014 (IPS) - Imagine a black-footed albatross feeding its chick plastic pellets, a baby seal in the North Pole helplessly struggling with an open-ended plastic bag wrapped tight around its neck, or a fishing vessel stranded mid-sea, a length of discarded nylon net entangled in its propeller. Multiply these scenarios a thousand-fold, and you get a glimpse of the state of the world’s oceans. With an average of 13,000 pieces of plastic litter estimated to be afloat every single square kilometer of ocean globally, and 6.4 million tonnes of marine litter reaching the oceans every year according to the United Nations Environment Programme (UNEP), researchers and scientists predict a bleak future for the great bodies of water that are vital to our planet’s existence. A conservative estimate of overall financial damage of plastic to marine ecosystems stands at 13 billion dollars each year, according to a press release from UNEP released on Oct. 1. “To entirely rid the ocean of litter is an aspiration not expected to be achieved in a lifetime, even if we stop waste inputs into the sea, which we still have not. The cost is too much. Much of the waste has been broken down and is beyond our reach. To clean the sea surface of [floating] litter itself will take a long time." -- Vincent Sweeney, coordinator of the Global Programme of Action for the Protection of the Marine Environment from Land-based Activities (GPA). With the 12th Conference of the Parties to the Convention on Biological Diversity (COP12) currently underway in Pyeongchang, South Korea, the issue of marine health and ocean ecosystems is in the spotlight. Of the 20 Aichi Bioiversity Targets agreed upon at a conference in Nagoya, Japan in 2010, the preservation of marine biodiversity emerged as a crucial goal, with Target 11 laying out the importance of designating ‘protected areas’ for the purpose of protecting marine ecosystems, particularly from the harmful effects of human activity. Speaking to IPS on sidelines of the 16th Global Meeting of the Regional Seas Conventions and Actions Plans (RSCAP) held in Athens from Sep. 29-Oct. 1, Tatjana Hema, programme officer of the marine pollution assessment and control component of the Mediterranean Action Plan, told IPS that marine debris results from humane behaviour, particularly land-based activities. The meeting drew scientists and policymakers from around the globe to chart a new roadmap to stop the rapid degradation of the world’s seas and oceans and set policies for their sustainable use and integration into the post‐2015 development agenda. There was a near unanimous consensus that marine littler posed a “tremendous challenge” to sustainable development in every region of the world. The issue has been given top priority since the Rio+20 Earth Summit in Brazil in 2012, and Goal 14 of the 17 proposed Sustainable Development Goals – which will replace the MDGs as the U.N.’s main blueprint for action at the end of this year – set the target of significantly reducing marine pollution by 2025. Wastes released from dump-sites near the coast or river banks, the littering of beaches, tourism and recreational use of the coasts, fishing industry activities, ship-breaking yards, legal and illegal dumping, and floods that flush waste into the sea all pose major challenges, experts say. 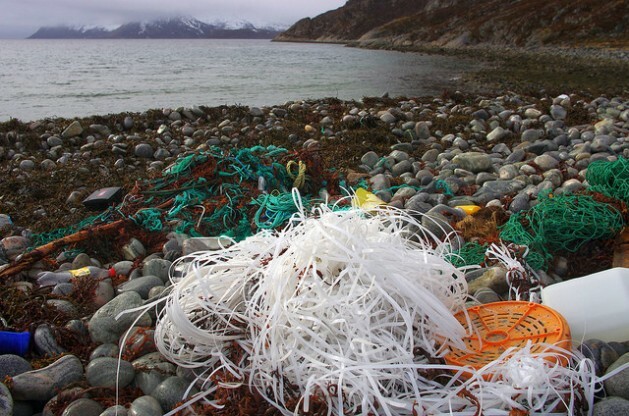 Similarly, plastics, microplastics, metals, glass, concrete and other construction materials, paper and cardboard, polystyrene, rubber, rope, fishing nets, traps, textiles, timber and hazardous materials such as munitions, asbestos and medical waste, as well as oil spills and shipwrecks are all defined as marine debris. “Organic waste is the main component of marine litter, amounting to 40-80 percent of municipal waste in developing countries compared to 20-25 percent in developed countries,” Hema said. Microplastics, however, emerged as one of the most damaging pollutants currently choking the seas. This killer substance is formed when plastics fragment and disintegrate into particles with an upper size limit of five millimeters in diameter (the size range most readily ingested by ocean-dwelling organisms), down to particles that measure just one mm in diameter. “Micro- and nano-plastics have been found [to have been] transferred to the micro-wall of algae. How this will affect the food chain of sea creatures and how human health is going to be affected by ingesting these through fish, we still do not know,” UNEP’s Vincent Sweeney, who coordinates the Global Programme of Action for the Protection of the Marine Environment from Land-based Activities (GPA), told IPS. “The extent of the microplastic problem till now is somewhat speculative; we still do not have a sense of how much of the oceans are affected,” he added. Ocean SDG targets have to stand up to four criteria: whether they are ‘actionable’, ‘feasible’, ‘measureable’ and ‘achievable’. Unlike, for example, the target of reducing ocean acidification (whose only driver is carbon dioxide), which easily meets all four criteria, the issue of marine debris is not as simple, partly because “what shows up on the beach is not necessarily an [indication] of what is inside the ocean,” Sweeney asserted. “Marine litter can move long distances, becoming international. Ownership is difficult to establish,” he added. Litter also accumulates in mid-ocean ‘gyres’, natural water-circulation phenomenon that tends to trap floating material. “To entirely rid the ocean of litter is an aspiration not expected to be achieved in a lifetime, even if we stop waste inputs into the sea, which we still have not. The cost is too much. Much of the waste has been broken down and is beyond our reach. To clean the sea surface of [floating] litter itself will take a long time,” Sweeney asserted. “Though there are different drivers for marine pollution in each country, the common factor is that we are consuming more and also generating more waste and much of this is plastic,” he concluded. Aside from insufficient data and the high cost of cleaning up marine litter, the Means of Implementation (MoI) or funding of the SDG ocean targets is yet another challenge for most regions. Northwest Pacific countries like China, Japan, Russia and Korea, however, have established replicable practices, according to Alexander Tkalin, coordinator of the UNEP Northwest Pacific Action Plan. “Korea and Japan are major donors and both have introduced legislation specifically on marine litter,” Tkalin told IPS on the sidelines of the meeting. “Japan has changed legislation to incentivise marine debris cleaning, tweaking its law under which, normally, one pays for littering, but the government now pays municipalities for beach-cleaning after typhoons, when roots and debris from the sea-floor are strewn on beaches,” Tkalin explained. 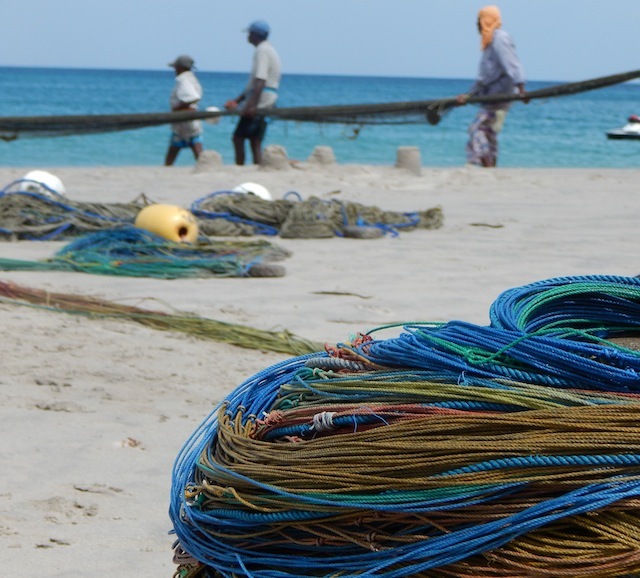 The Dutch and the U.S. also have strong on-going programmes on marine debris, as does Haiti, according to Sweeney. The extent of the crisis was brought home when Evangelos Papathanassiou, research director at the Hellenic Centre for Marine Research in Attiki, 15 kilometres from Athens, told visiting regional journalists about his experience of finding a sewing machine at a depth of 4,000 feet in the Mediterranean Sea. “Even though man-made marine pollution from aquaculture, tourism and transportation are most pressing in the Mediterranean and Black Sea, they are not getting the deserved attention,” he added. If the new development era is to be a successful one, experts conclude, we terrestrial beings must urgently turn our attention to the seas, which are crying out for urgent assistance.